Maintaining proper temperature is one of the most important factors in aquarium care. The Fluval E Heaters continuously monitor and display aquarium water temperature, ensuring the well-being of your aquarium inhabitants. Simply the most technologically advanced submersible aquarium heaters available today, the Fluval E Series features VueTech technology. Its LCD display delivers peace of mind by continuously showing real time water temperatures. During normal operation the temperature display changes color if the aquarium water temperature varies from the pre-set temperature. Should external heat sources or other equipment cause the aquarium water temperature to rise or fall excessively the colored screen will flash, indicating a potential risk. VueTech Technology for precision and safety- During normal operation the temperature readout will change color if the aquarium water varies +/-2 degrees F or more from the pre-set temperature. 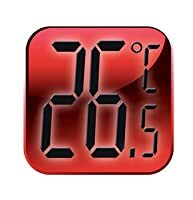 Should any external heat sources or other equipment, such as chillers, cause the aquarium water temperature to rise or fall beyond 5.5 °F, the colored screen will flash, indicating a potential risk. 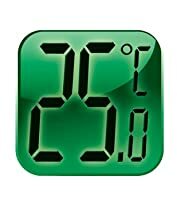 The ability to measure temperature in Celsius is also an option. Precise temperature setting- With the easy to use adjustment lever, the temperature can be precisely set in 0.5° increments. Advanced safety- The integrated fish guard offers advanced protection. Fish and invertebrates cannot come into direct contact with the heater core. The glass sleeve is also protected against shocks from large fish species. Heater bracket- Built with a secure slim profile mounting bracket. The heater can be adjusted or removed without removing the mounting bracket. The great asset of the mounting bracket is its ability for you to mount the heater at varied angles, so you can view the front screen in any direction you wish. For those with a marine aquarium and sump, you can also attach the Fluval E heater there. Digital micro-processor- Advanced micro-processor technology with dual temperature sensors provide accurate and real time water temperature readings. The temperature sensing technology is as precise as an external probe! The internal Thermal Sensor samples the actual water temperature directly through the glass of the heater tube rather than the air temperature within the tube, as is the case with standard bi-metallic strip thermostats. Since the Thermal Sensor actually reads the true water temperature, it is more accurate and reliable than conventional bi-metallic heaters. Advanced Electronic Circuitry, no moving parts to wear out! Since the FLUVAL E heater has no bi-metallic points, there are no moving parts to arc, corrode or wear. The thermostatic control of the heater is separated from the water thermal sensor, different from conventional bi-metallic heaters, where the sensor is directly built into the thermostat. It is therefore less affected by extraneous factors. It’s recommended to fill the aquarium with water that is close to the desired temperature you are trying to achieve. 1. Position the heater in the aquarium (vertically or horizontally) and press suction cups firmly against glass, to adhere to the aquarium wall. If rear glass mounting is not possible, use the side glass mounting adapter. 2. Allow heater to acclimatize in the aquarium water temperature for 20 minutes before plugging it into the electrical outlet. 3. After 20 minutes, plug in the heater and set the degree scale if necessary. 4. At each Power-on, the E Heater goes through an initial self-test procedure during which it carries out a self-diagnosis to check internal circuitry and sensors operation, followed by a period to verify the surrounding conditions. WARNING: The heater must never be operated outside of the aquarium. 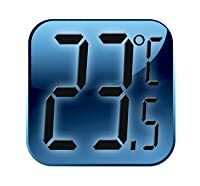 If the water level falls below the minimum water level MIN, the thermostat can no longer "read” the water temperature and therefore can no longer control the heating correctly. If it has to be taken out of the water or when transferring or changing the water, disconnect the heater from the power source and wait for at least 30 minutes to allow it to cool down. 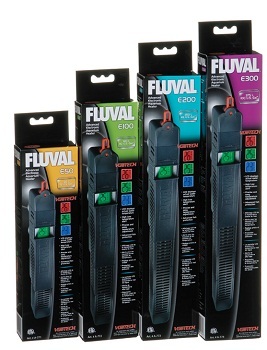 Fluval E Series Heaters are guaranteed against defects in material or workmanship under normal aquarium usage and service for 5 years. We offer a 5 year guarantee on all non-replaceable parts which means that the heater will be repaired or replaced at the manufacturer's discretion, free of charge, when the complete heater is returned with proof of purchase and postage paid. This warranty does not apply to any heater that has been subjected to misuse, negligence, or tampering. Check out user manual under Product details before using the item.